Foshan Sheng bang Steel Structure Co., Ltd.
Foshan Sheng bang Steel Structure Co., Ltd Possesses professional large-scale steel structure production equipment’s and the automatic spraying production Line, apply to steel structure warehouse,factory buildings ,hangars and other steel structure building,so we can satisfy the different customer’s demand. We takes "build your future" as mission and takes company growth as premise. High quality marketing personnel, professional technician and construction workers. We take the customers' demand as the guidance’s, then provide reasonable, Scientific and effective solution for customers. We regard practical growth, innovation and group solidarity as our company spirit, so that we can offer all round service to customers. Foshan Steel Structure Co., Ltd. lower cost, shorter duration. Strong technical strength, to provide you with exclusive design. Structural engineers and technical staff of more than 100 people, and continue to attract outstanding and experienced professionals and other related graduates. 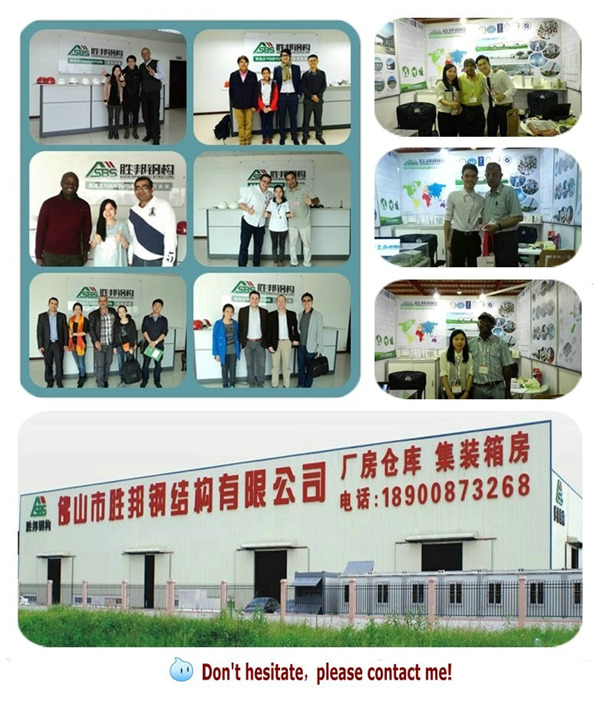 Design team for many years In-depth study, Shengbang Steel Structure Company in the steel structure building, reconstruction and reinforcement project has a very high level of design, design programs repeatedly won the high praise from all walks of life. Shengbang steel structure to effectively protect the project quality, safety and duration. Rich design, construction experience, thousands of engineering experience, including hundreds of major and difficult projects. Shengbang Steel has created a professional service system in terms of program design, construction, material supply and quality supervision, and achieved leading standards in design, production, construction and management. Shengbang steel structure throughout the construction are equipped with strict inspection and testing mechanism to ensure project quality and safety. Victory state complete national accreditation, with the state issued by the structural transformation and reinforcement of professional contracting special qualifications. Since its strategic cooperation in 2011, Foshan Sheng bang Steel Structure Co., Ltd. (hereinafter referred to as "Sheng bang") has set up a series of systems including system establishment, team building, organizational structure, market system layout, economic benefits, quality and technology Management and other aspects, have improved, the management team has also adapted to the new development model. With the continuous expansion of the company scale and the gradual extension of the market system, the strength of the company's overall market development capability, processing capability, construction capability, technology management capability and capital operation capability has become increasingly prominent. In order to further develop Sheng bang, according to the actual situation of the Company and in combination with the external development environment, we formulate a new round of strategic plan for the Company and formulate a series of measures to ensure the smooth implementation of the strategic plan to promote the sustainable and healthy development of the Company At the same time, to achieve the company's overall competitiveness by leaps and bounds.